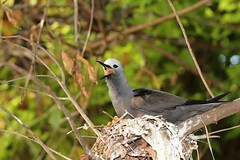 Nature Seychelles is Partner to BirdLife international and the national NGO managing Cousin Island Special Reserve, an Important Bird Area (IBA) with seven globally important seabird species occurring there. Each year thousands of Tropic birds, White Terns, Lesser Noddy, Brown Noddy and Wedge-Tail Shearwaters nest as well as hundreds of Tropical Shearwaters and Bridled Terns. The Island with its varied habitats provides ideal nesting space for these birds. Throughout the year censuses are carried out on population numbers and breeding success as well as occasional behavioural studies. Where time and resources allowed the birds are ringed with SAFRING so that the birds can be identified in the future here on Cousin or perhaps at another location. As some bird species breed year round it is impossible to gain a population number from one s snapshot census and therefore at least 2 full seabird censuses are carried out yearly. This data provides critical information on population trends and allows collaboration between the SSG to monitor and manage the Seychelles seabird populations.